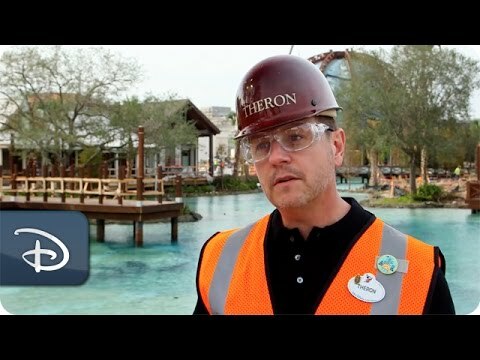 Working for two years with as many as 300 workers on site, KHS&S was part of the design and construction team that transformed the former Downtown Disney® Area into Disney Springs™. Starting with preconstruction collaboration with WDI, contractors and architects, KHS&S artisans and craftsmen provided highly themed architectural features, durable and energy-saving exteriors and a dazzling re-creation of a Florida spring highlighted by sculpted and paint-washed rockwork. Interior scopes of work include metal studs, framing, drywall and insulation. Exterior scopes of work include exterior theming, including stucco and base painting; wood work, including wood lap siding and shingles; thermal and moisture protection on exterior walls; themed, prefabricated architectural structures; sculpted rockwork in the project’s signature streambed; and rockwork on shoreline transition areas. In total, the project encompassed 260,000 square feet of stucco on exteriors; 55,000 square feet of spring bottom; and one-half mile of carved and painted spring bank.